Two young boys find their friendship threatened by their parents' business dispute. A cheap, yet all too common storytelling trope is to equate affluence with villainy, and it's one Sachs and co-writer Mauricio Zacharias commendably bin here. There are no villains in this story; both parties are simply trying to do right by their families. There are few tropes more annoying in cinema than movies that use their child characters as a device with which to lecture to adults. "If a 10-year-old can understand subject x, why can't we?" You know the sort of thing. Thankfully that's not what we get with the latest offering from writer-director Ira Sachs. The child protagonists of Little Men, 13-year-olds Jake (Theo Taplitz) and Tony (Michael Barbieri), are allowed to be children rather than philosophical cyphers. They offer no easy answers to the film's central issue. Jake and Tony become instant friends when the former's family moves into the apartment above the struggling clothes shop run by the latter's Chilean immigrant mother, Leonor (Paulina Garcia). The store and apartment were left to Jake's father, Brian (Greg Kinnear), and aunt, Audrey (Talia Balsam), following the death of their father. Trouble begins when Audrey insists she receive a cut of her father's will, in the form of rent from Leonor's store, the value of which has grown exponentially due to the ongoing gentrification of its Brooklyn neighbourhood. Audrey insists the rent should be tripled, a calculation that still falls considerably short of its market value, but when Brian brings this up to Leonor, she digs her heels in, claiming his father would want her to stay. With their parents bickering over business, Jake and Tony find their nascent friendship under threat. Another cheap, yet all too common storytelling trope is to equate affluence with villainy, and it's one Sachs and co-writer Mauricio Zacharias commendably bin here. There are no villains in this story; both parties are simply trying to do right by their families. Jake's family may seem like the classic white middle class archetype, but it's held together by the wages of his psychologist mother, Kathy (Jennifer Ehle). Brian has been struggling with his acting career for quite a while, something Leonor brings up in a cruel moment of emasculation during one of their confrontations. We're reminded of Ian MacLaren's disputed quote "Be pitiful, for every man is fighting a hard battle." As regards Jake and Tony, the film offers the most honest depiction of children since Lukas Moodysson's We Are the Best!. Their friendship is intense, but there's never a sense that it's set to last. Tony, played with winning charisma by Barbieri, is the sort of boy who could make instant friends with anyone - Jake just happens to be around at this point in time - while the quiet and sensitive Jake simply needs someone to make him feel valued. Most of their time together consists of Tony talking about himself, Jake thinking about himself. Like most of our childhood friendships, theirs is simply a coincidence of time and geography, and the film's affecting final scene is brutally sincere on this point, a very human moment in a very human film. 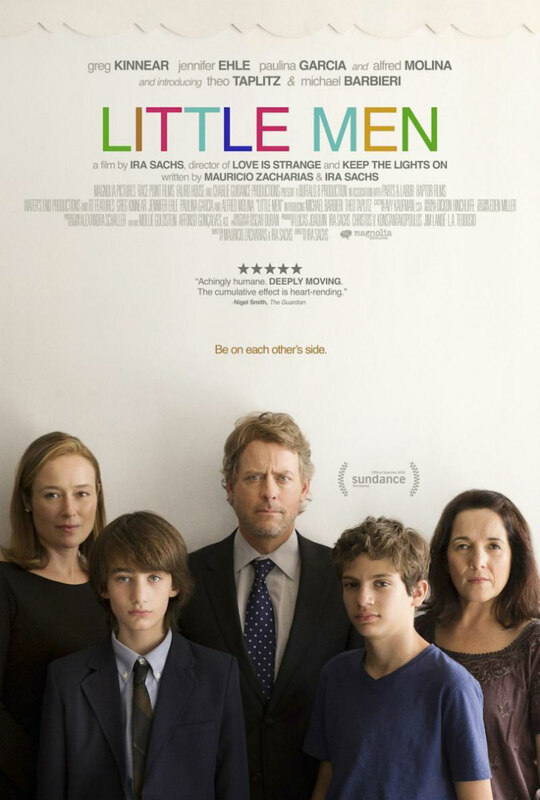 Little Men is in cinemas September 23rd.